Rhinia (Ρήνεια) or Rhenea or Rinia, or Rineia also known as Greater Delos, is an almost deserted island five miles SW of Myconos. The anchorages around the island make a pleasant stop for people who avoid the noise of "civilization" and are a good overnight base prior to a visit by yacht to the archaeological site of Delos, from which it is separated by a 100 metre wide channel. Today only a few people from Mykonos keep some animals on Rhinia and during the summer months stay in isolated cottages. The island has three anchorages, South Bay, Miso Bay and Skhino Bay, the first providing good shelter in the prevailing northerlies, the second in winds from N round to SE and the third in winds from W round to SE. The latter two are, however, rock-fringed and care is needed. Delos is a small island without a secure anchorage. The main interest here is in the antiquities and its history. According to the Greek mythology Delos was a floating island where Leto, after being impregnated by Zeus and refused by every land because of the wrath of Hera, gave birth to Apollo and Artemis. Apollo chained the island to the floor of the Aegean sea. In historical times the powerful tyrant of Samos, Polycrates, donated the island of Rhinia to the sanctuary of Apollo in Delos and attached a chain across the channel. The tyrant of Athens, Peisistratos, undertook to "purify" the sacred island of Delos by digging up the bones from burials there and conveying them to Rhinia for reburial. After the Persian Wars (490, 480-79 BC), the Delian League, the Athenian-led naval alliance against Persian expansion, was formed in 477 on the island of Delos. During the fifth century Delos and Rhinia were controlled by the Athenians who continued to guard the sanctity of Delos by forbidding both births and deaths on the island. Pregnant women and old people were taken across the channel to Rhinia to give birth or die. Many graves have been excavated and the finds are exhibited at the Museum in Mykonos. The anchorage at Delos may only be used between 0800 and 1500 for the purpose of visiting the archaeological site. It is entered from the S between the islet of Megali Rematia and Delos (while there is a narrow passage between the N end of Megali Rematia and the breakwater of Delos, depths are reportedly as little as 2.0 metres and this passage is not for the fainthearted). Megali Rematia should be given a good clearance on entry, especially on the SE side, as there are dangerous reefs around its shores. Proceed up the channel between Megali Rematia and Delos in the direction of the small tripper boat harbour, which is protected from northerlies by a 200 metre long breakwater. Depths are better on the port side of the channel (but only once past the dangerous reef at the SE end of Megali Rematia) and shoal rapidly from 15-18 metres at the entrance to only 3.0 - 4.0 metres or less near the breakwater. Most yachts anchor about 100 metres due S of the breakwater end in 4.0 - 5.0 metres. The holding here is only moderately good in sand and rock and it is advisable to use at least 35 metres of chain and snub your anchor carefully before leaving your yacht. Dinghies are directed to land at the steps at the NE end of the breakwater, clear of the tripper boat quay. Warning: Proceed north, up the shallow channel between Delos and Rhinia watching out for the many reefs. Approaches to the island are straightforward, although those to the anchorages less so. The channel between Rhinia and Delos funnels the gusts in strong northerlies and there is a heavy confused swell in these conditions, since depths shoal to around 8.0 metres in its narrowest part. Care is needed to stay in the centre of the channel to avoid rocky ledges on either side. The approaches to Miso Bay on the W side of the island and Skhinou Bay on the E side are both fringed with above and below water rocks. A lookout on the bow or a large scale chart is essential on a first visit. Although not actually on the island of Rhinia, the anchorage at Delos is included here as most yachts will be visiting it before or after anchoring at Rhinia. South Bay provides excellent shelter from the meltemi in a beautiful setting. 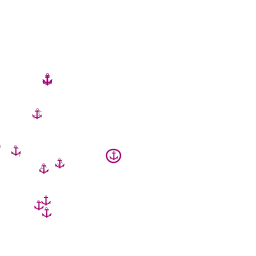 There are three different places to anchor, according to the prevailing wind. The small bay at the NE corner is idyllic but shallow, with only 3.0 – 4.0 metres and not much room to swing – a couple of yachts here and it is full. The wider bay at the NW corner has better depths of 5.0 – 6.0 metres and can comfortably accommodate 5-6 yachts at anchor. On the E side of the Bay is a tiny N-facing cove with a small sandy beach where yachts often anchor and take a line ashore to the rocks on its W side. This position gives better shelter in light to moderate southerlies. The bottom everywhere is sand with some rocks and weed and the holding very good. In the summer, there are a few tripper boats during the day, but they leave by late afternoon and you can have this wonderful cove all to yourself. Warning: In the fall, the wind can change abruptly at night from the north to the south: use a line to the rocks in the middle of the cove. Miso Bay lies on the W side of the island and, while it also provides some shelter from the meltemi, it is not as good as South Bay. Only in SE winds would Miso Bay probably provide better shelter than South Bay. There are rocky reefs extending off the shore on both the N and S side of the bay. An approach on a course of 055 should carry you clear of the dangers, although it is wise to have a crew member at the bow and to keep a close eye on the depth sounder. 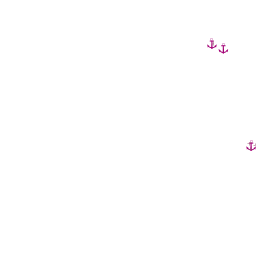 Anchor in 4.0 – 5.0 metres. The bottom is sand and weed and good holding. Skhino Bay lies on the E side of the island and provides several places to anchor depending on the wind direction. The small coves at the N and S end are the best anchorages, but neither is particularly well sheltered in the meltemi, especially the S cove, both coves are protected from the southerlies. Shelter here is, however, better than South Bay in southerlies. Both coves are surrounded by dangerous rocks and, again, it is wise to have a crew member at the bow and to keep a close eye on the depth sounder. Anchor in either cove or, in settled conditions, in the middle of the bay in 3.0 – 8.0 m. The bottom is sand and very good holding. The shore here is often heavily littered with flotsam. Warning: There are two principal rocks to be avoided on entering the North Cove, both marked. The one nearer to the point has a small concrete pillar mounted on it, the other has a metal spike and a small orange buoy. It is possible to pass between them but safer to leave both to starboard on entry. Once inside all other obstructions are obvious. A simple café on site at Delos. Only day tour boats from Mykonos. Rhinia's history is closely associated with that of Delos. The tyrant of Athens, Peisistratos, undertook to "purify" the sacred island of Delos by digging up the bones from burials there and conveying them to Rhinia for reburial. After the Persian Wars (490, 480-79 BC), the Delian League, the Athenian-led naval alliance against Persian expansion, was formed in 477 on the island of Delos. During the fifth century, Delos and Rhinia were controlled by the Athenians who continued to guard the sanctity of Delos by forbidding both births and deaths on the island. Pregnant women and old people were taken across the channel to Rhinia to give birth or die. Many graves have been excavated and the finds are exhibited at the Museum in Mykonos. Most yachts visit Rhinia for the purpose of a visit to the World Heritage listed site of ancient Delos. The site can be visited from 0900 to 1500 each day except Mondays, when it is closed. Details of the main attractions on Delos can be obtained from Wikipedia or any good guide book. If you are interested in ancient ruins, a good 2-3 hours are needed to visit the whole site. An hour to ninety minutes would do to whizz around the key attractions. For the energetic, the climb up to the top of Mt Kythnos, the rocky crag that dominates the island, offers spectacular views of the site and the anchorage beyond. There is a simple café on the site which offers sandwiches and basic refreshments (at a price), plus toilets and a museum with some examples of statuary, mosaics and wall frescoes recovered from the site. This page was last modified on 15 August 2018, at 12:16. This page has been accessed 26,113 times.